Much has been made in the past five years of the potential for CMOS imagers and of the impending demise of the incumbent image-sensing technology,CCDs. Strong claims by the proponents of a resurgent CMOS technology have been countered by equally forceful claims by CCD defenders. In a pattern typical of battling technologies (both with significant merits but also lacking maturity in some regards), users have become leery of performance representations made by both camps. Overly aggressive promotion of both technologies has led to considerable fear, uncertainty and doubt. When exposure is complete, a CCD (Figure 1) transfers each pixel’s charge packet sequentially to a common output structure, which converts the charge to a voltage, buffers it and sends it off-chip. 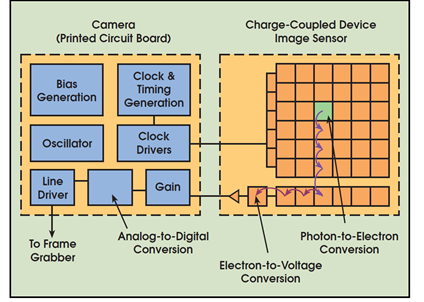 In a CMOS imager (Figure 2), the charge-to-voltage conversion takes place in each pixel. This difference in readout techniques has significant implications for sensor architecture, capabilities and limitations. Figure 1. On a CCD, most functions take place on the camera’s printed circuit board. If the application’s demands change, a designer can change the electronics without redesigning the imager. • Responsivity, the amount of signal the sensor delivers per unit of input optical energy. CMOS imagers are marginally superior to CCDs, in general, because gain elements are easier to place on a CMOS image sensor. Their complementary transistors allow low-power high-gain amplifiers whereas CCD amplification usually comes at a significant power penalty. 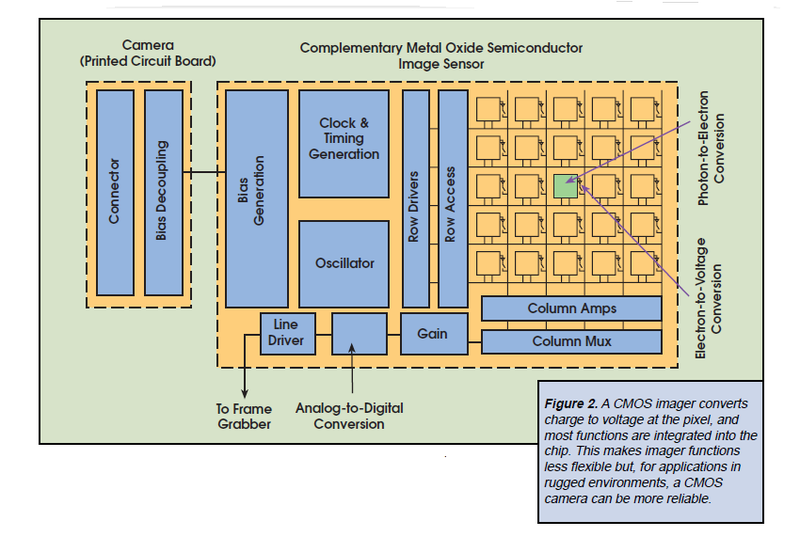 Some CCD manufacturers are challenging this conception with new readout amplifier techniques. • Dynamic range, the ratio of a pixel’s saturation level to its signal threshold. It gives CCDs an advantage by about a factor of two in comparable circumstances. 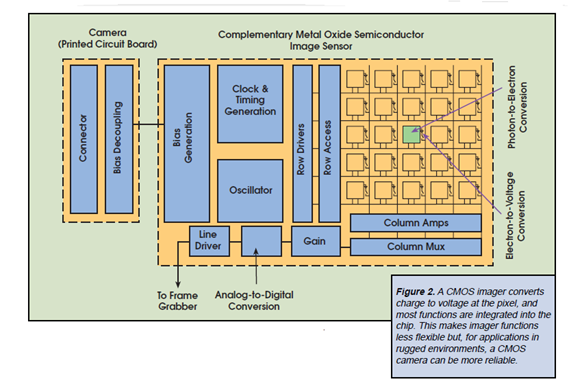 CCDs still enjoy significant noise advantages over CMOS imagers because of quieter sensor substrates (less on-chip circuitry), inherent tolerance to bus capacitance variations and common output amplifiers with transistor geometries that can be easily adapted for minimal noise. Externally coddling the image sensor through cooling, better optics, more resolution or adapted off-chip electronics cannot make CMOS sensors equivalent to CCDs in this regard. • Uniformity, the consistency of response for different pixels under identical illumination conditions. Ideally, behavior would be uniform, but spatial wafer processing variations, particulate defects and amplifier variations create nonuniformities. It is important to make a distinction between uniformity under illumination and uniformity at or near dark. CMOS imagers were traditionally much worse under both regimes. Each pixel had an openloop output amplifier, and the offset and gain of each amplifier varied considerably because of wafer processing variations, making both dark and illuminated nonuniformities worse than those in CCDs. Some people predicted that this would defeat CMOS imagers as device geometries shrank and variances increased. • Shuttering, the ability to start and stop exposure arbitrarily. It is a standard feature of virtually all consumer and most industrial CCDs, especially interline transfer devices, and is particularly important in machine vision applications. CCDs can deliver superior electronic shuttering, with little fill-factor compromise, even in small-pixel image sensors. • Speed, an area in which CMOS arguably has the advantage over CCDs because all camera functions can be placed on the image sensor. With one die, signal and power trace distances can be shorter, with less inductance, capacitance and propagation delays. To date, though, CMOS imagers have established only modest advantages in this regard, largely because of early focus on consumer applications that do not demand notably high speeds compared with the CCD’s industrial, scientific and medical applications. • Windowing. One unique capability of CMOS technology is the ability to read out a portion of the image sensor. This allows elevated frame or line rates for small regions of interest. This is an enabling capability for CMOS imagers in some applications, such as high-temporal-precision object tracking in a subregion of an image. CCDs generally have limited abilities in windowing. • Antiblooming, the ability to gracefully drain localized overexposure without compromising the rest of the image in the sensor. CMOS generally has natural blooming immunity. CCDs, on the other hand, require specific engineering to achieve this capability. Many CCDs that have been developed for consumer applications do, but those developed for scientific applications generally do not. • Biasing and clocking. CMOS imagers have a clear edge in this regard. They generally operate with a single bias voltage and clock level. Nonstandard biases are generated on-chip with charge pump circuitry isolated from the user unless there is some noise leakage. 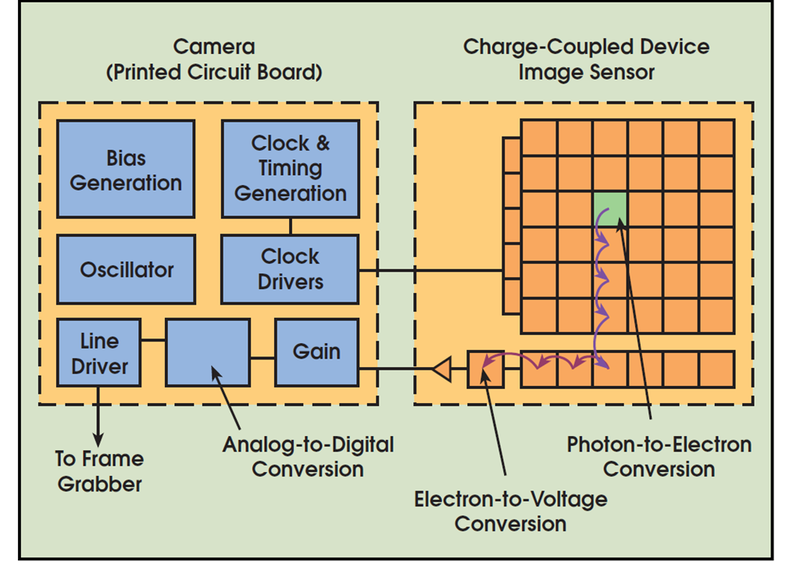 CCDs typically require a few higher-voltage biases, but clocking has been simplified in modern devices that operate with low-voltage clocks. The user needs to consider, however, the cost of this integration. CMOS imagers are manufactured in a wafer fabrication process that must be tailored for imaging performance. These process adaptations, compared with a nonimaging mixed-signal process, come with some penalties in device scaling and power dissipation. Although the pixel portion of the CMOS imager almost invriably has lower power dissipation than a CCD, the power dissipation of other circuits on the device can be higher than that of a CCD using companion chips from otimized analog, digital and mixed signal processes. At a system level, this calls into question the notion that MOS-based cameras have lower power dissipation than CCDbased cameras. Often, CMOS is better, but it is not unequivocally the case, especially at high speeds (above about 25-MHz readout). However, the accommodations required for good electro-optical performance mean that CMOS imagers must be made on specialty, lower volume, optically adapted mixed-signal processes and production lines. CMOS users must be aware of their suppliers’ profitability and cost structure to ensure that the technology will be sustainable. The customer’s interest and the venture capitalist’s interest are not well-aligned: Investors want highest return, even if that means highest risk, whereas customers need stability because of the high cost of midstream system design change. For the moment, CCDs and CMOS remain complementary technologies— one can do things uniquely that the other cannot. 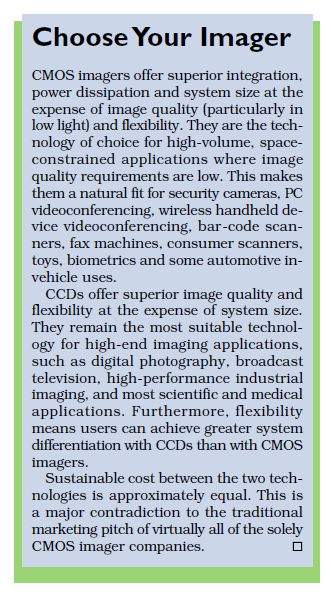 Over time, this stark distinction will soften, with CMOS imagers consuming more and more of the CCD’s traditional applications. But this process will take the better part of a decade — at the very least.